If you read Nicole's Scarlet Letter Year blog, you've probably already seen these pics. Ann Smith had some progress, and I started on some of the over-1 stitching. The plan to use tent stitch for the over 1 (except the words) didn't work out. 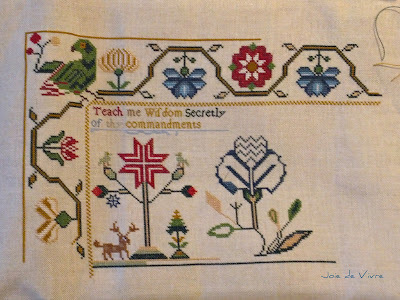 I wasn't getting good enough coverage on the 35 count linen, so all that over 1 is being done with full crosses. Miss Ann has a lot of over 1. Mom and I were discussing that deer on the left one night. I thought it looked like a moose. She thinks its a donkey with antlers. I really laughed at that. The after Christmas illness that hit the household caught up with me. All 3 of us were on antibiotics for sinus infections, and I still have the lingering crud - cough and congestion. I'm not complaining too much, since this is what I lived with 90% of my time in Utah. I loved Utah, my body didn't. When I was at my worst, I indulged in a couple of new starts, partly because I didn't feel like facing the over 1 on Ann. Meet Elizabeth Burrows. She's a small sampler, but requires some mental agility since the stitches are over 2, 3, and 4 threads. It was my first exposure to the Montenegrin stitch and Italian cross. I'm in love. I chose 4 silks from my stash, trying to respect Elizabeth's original choices, but drew the line at pale pink. Instead I substituted an overdyed cream silk that had some touches of peach and taupe. 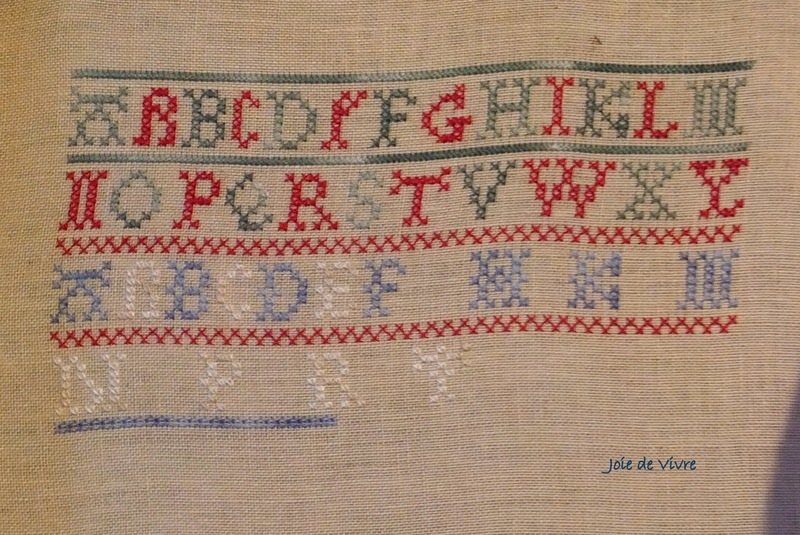 Since taking this picture I've gotten down to the alphabet stitched in eyelets. I usually substitute smyrna crosses for eyelets, but I'm actually going with the more time consuming eyelets. Its worth it, they look great. My other new start was CCN's Santa's Village. This is going to be a huge piece when finished, even stitched on 36 count. I changed out some of the floss, using overdyed cotton from my stash, but decided to stay with some of the bright colors. I'm questioning that now, but I'm not going to rip out what's stitched. Instead I pulled a darker and more muted red, and will bring some of that in, starting with the berries that should be in the bottom border. My wreath is missing its berries, and Santa his eyes, and of course the star on the top of the tree. I want to use some seed beeds and the JABCO button, so will wait until the end to attach those. My goal for this year is to focus more on my "serious" stitching, with just enough "fun" stitching to keep life lively. 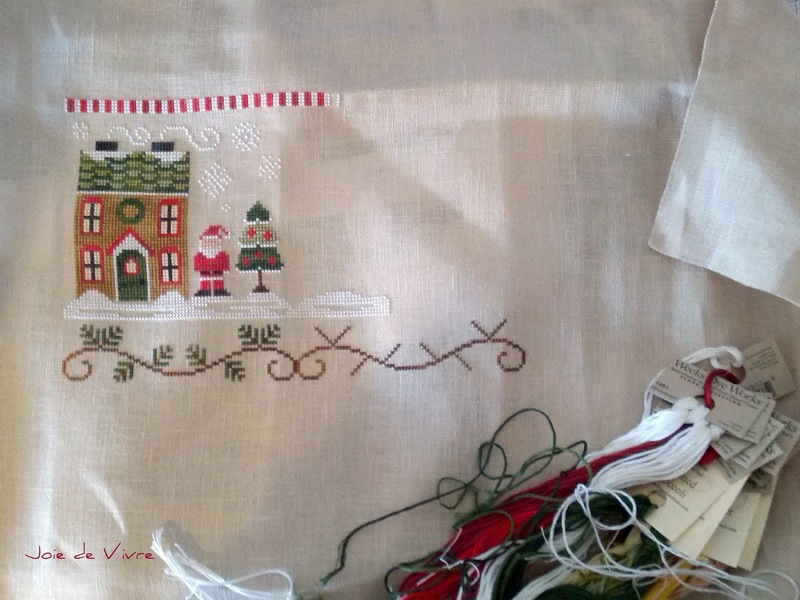 I love my "serious" projects, but they tend to get pushed to the side so easily with my love for seasonal stitching. Glad you're feeling better, even with the lingering crud! Your "serious samplers" are so pretty, and don't we all get distracted with seasonal pieces? 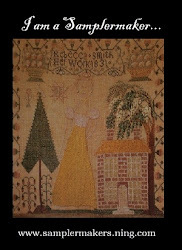 Be well - happy stitching! Serious stitching? I kinda like that concept. I'm doing the Santa's village too but keep wanting to work on something else... Now you got me thinking. Your serious samplers are so pretty....i love them..
Great starts on all accounts so far! I know just what you mean about the seasonal stuff. It gets me too everytime. I hope you feel better soon. Glad to hear that you guys are on the mend! Love the stitching snaps...and the sailing box you made for your dad in your last post is gorgeous. I think 2013 is going to be my serious year too...it always seems to be the uneven years that I knuckle down on the big pieces, while the even years get all the quick and quirky fun ones, LOL! Oh boy! I read so much of this "crud", so glad we have not experienced it. Very beautiful stitches going on. You're making great progress on Ann, Mindi. I haven't liked my coverage on 35 count very much - the tent stitches have been fine, but the over two is where I've seen some background fabric. I'm too far along now to go back. If it hadn't been for the over one I probably would have done mine on 40 count! All of your stitching is wonderful! Ann Smith is my favorite, but then I'm a repro kinda girl. lol! Hope you are all feeling better soon. Not fun being sick. Hope you are all feeling better! Lovely stitching! I think I had the same crud you had and it really hangs on! I'm finally all better. Ann Smith is just beautiful! Glad to hear you are feeling better. I, on the other hand, is feeling this virus getting to me!!!!! Everything looks so pretty, Mindi--you're making great progress on your Scarlet Letter piece... and I love the Santa's village WIP, too. It looks like such a fun piece to stitch. What nice projects! Hope you're feeling better soon. All of your WIPs are so lovely! I hope you're better now, and that you have a nice restful weekend. So pleased you are getting over the horrible bug that has been doing the rounds. Your sitching is so beautiful. Your stitching is beautiful and your blog is lovely. Your stitching is looking amazing. You have made such a wonderful start Ann Smith. I started Susan Singleton on 35 count with one thread over two and I am very unhappy with the coverage. I am just unsure what I should do now. Love your progress and I think the coverage is fine. I had that issue when I was working on Jane Philpott but I stuck it through and did full crosses with the 1 over 1. 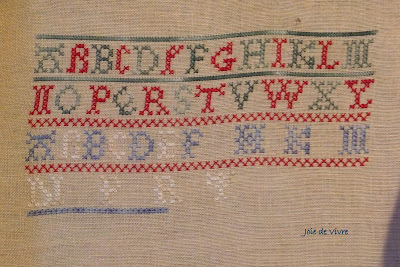 It's such a lovely sampler! !